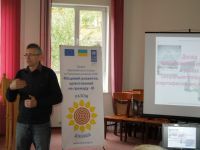 On October 14-16, 2015, The joint EU/UNDP “Community Based Approach to Local Development” Project (CBA) held in Ivano-Frankivsk region the cluster training on studying results of special piloting on energyefficiency of region during second phase of the Project. Regional coordinators of CBA Project from Volyn, Zakarpattiaa, Lviv, Chernivtsi, Ternopil and Ivano-Frankivsk regions together with heads of communities, authority representatives, academics, technical experts, representatives of NGO and private businesses learned the results of implementing communities’ microprojects of using solar energy. The main goal of this tutorial visit was to raise awareness of representatives from seven regions about successful practices of implementation alternative energy technologies, namely, solar energy generation, discuss results, problems and ways of dealing with them, perspectives of using them in future, and possible farther improvement. During seminar, each region presented results of implementing microprojects in their communities. 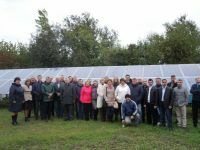 Participants also visited three objects in Kosivskyi rayon of Ivano-Frankivska oblast – Tiudiv, Yavori and Rozhniv villages – and discussed specifics of using innovative technologies in energyefficiency sphere, for example, renewable energy sources and optimizing of heating system at social objects. Representatives of each region admitted the idea of holding such cluster (regional) event as successful. 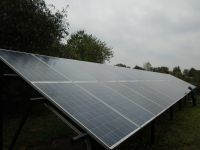 This method contributes to better understanding of specifics of producing solar power energy and using these results more efficiently in new projects. In addition, participants together admitted that educational institutions should use implemented projects as research area and popularize there innovative ideas in energysaving and energyefficiency.